Many people will know Murano by Angela Hartnett from when it use to be part of the Gordon Ramsay family. But in 2010 Hartnett and Ramsay decided to part ways. Other than the change in ownership, little else seems to have changed. 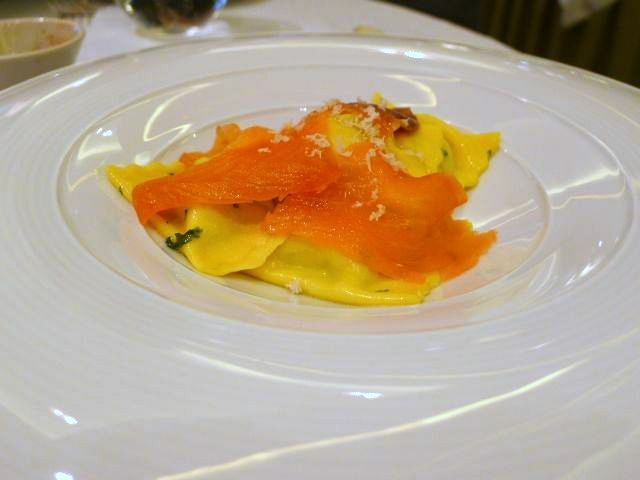 The restaurant is still Italian and it still holds a one Michelin star. Angela Hartnett might be the front woman for Murano, but it is really Diego Cardoso who is it’s head chef. 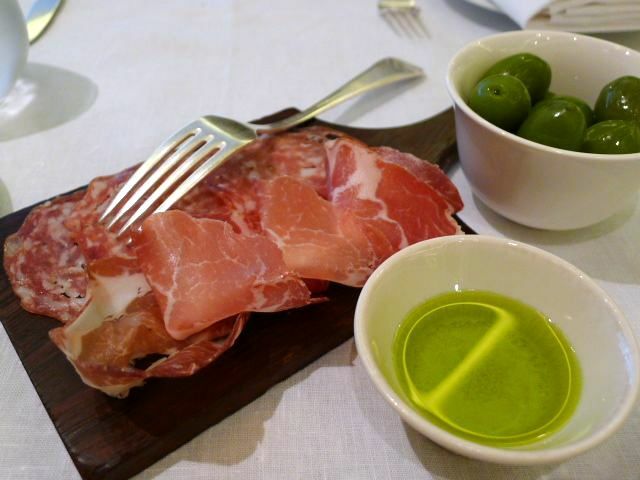 I tried the set lunch menu at Murano about three and a half years ago and thought it to be great value. The portion sizes of each of the courses were pretty generous, and before we even began our meal we were plied with a plentiful platter of hams. All this for an incredible price of £25 for three courses. Consequently I have always wanted to visit Murano for lunch again, and that I did recently. Conceptually, little has changed about the restaurant, not even the interior, but the set lunch menu portions have shrunk somewhat. The coppa di parma and salami platter we got at the beginning of the meal was much smaller than that dished up during my previous visit and we had to share this between four. Nevertheless the platter was very tasty. The set lunch menu is now priced at £30 for three courses (with a 2 course option for £25). 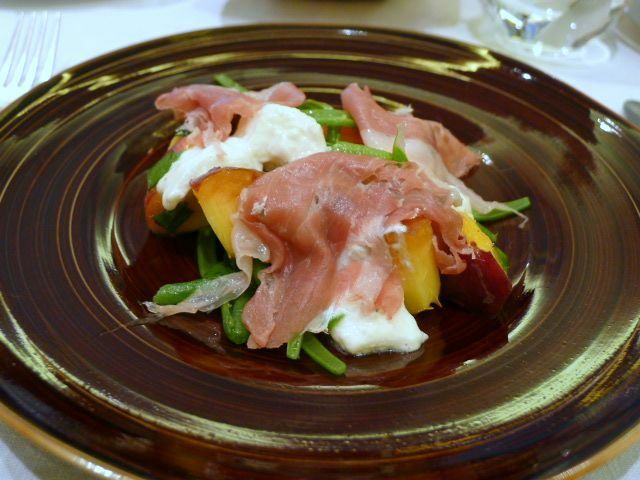 A salad of peaches, burrata and San Daniele ham for starters was delicious. The peaches were juicy sweet, and its sweetness complimented the gentle saltiness of the ham perfectly, with the burrata adding a warm creaminess. There was a hint of basil running through the salad which was lovely. The pasta used in the courgette and ricotta tortelli was a little too thick. Topped with smoked salmon and finished with apple and horseradish, the combination worked well, but the dish was a bit dry. 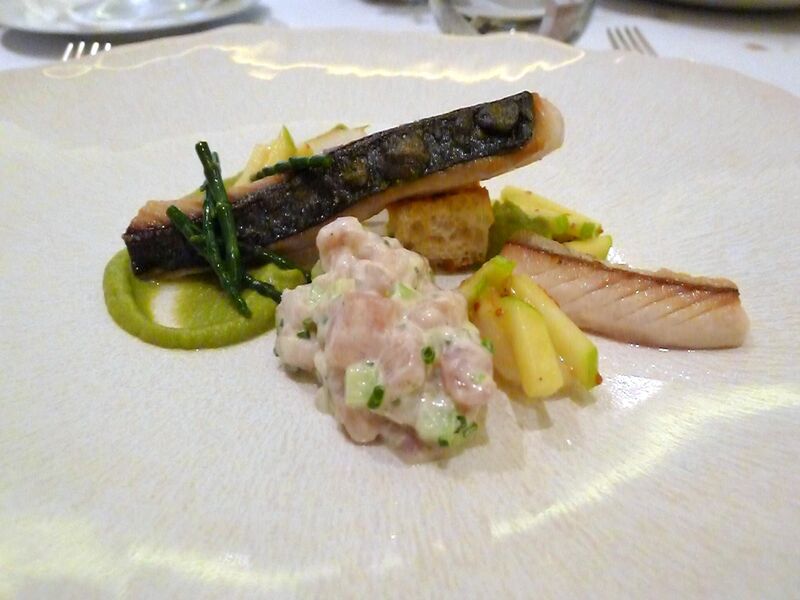 Cornish mackerel served two ways, roasted and tartare, was nicely prepared. Served with a creamy pea purée, crunchy samphire and grilled sourdough, tiny slivers of fresh sweet apple added an appetising contrast to the fish. Welsh rump of lamb was cooked to medium rare and held a gamey flavour. 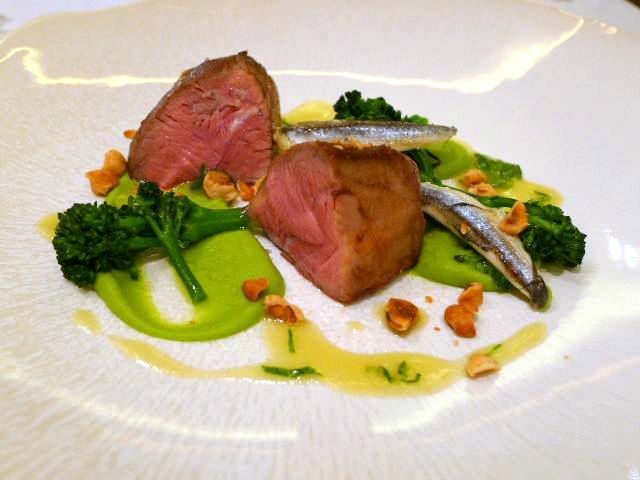 Again served with pea purée, toasted hazelnuts provided crunchiness and anchovies suggested a hint of of the Mediterranean. Both main courses were tasty and showed skill, but were a little meanly sized. Prosecco mousse with strawberries, shortbread and basil leaves was pretty as a picture but it turned out to be quite bland. The mousse had a nice texture but little taste, and the shortbread wasn’t particularly buttery, nor did it crumble in the way good shortbread should. 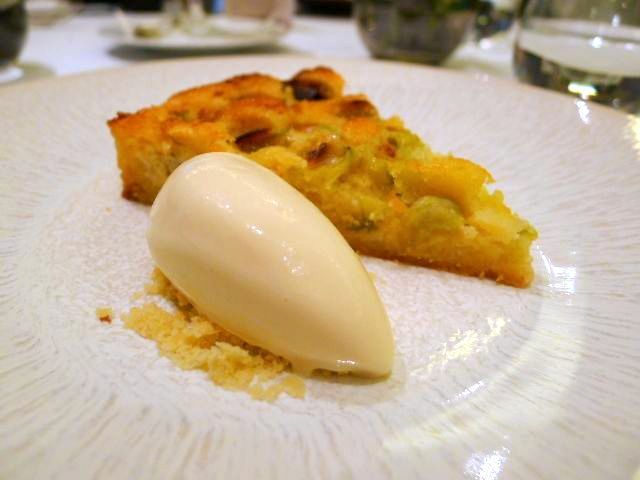 But a gooseberry and frangipane tart turned out to be divine and was the highlight dish of the lunch. The pastry was fantastic and flakey, and the filling was moist, airy and light. The honey ice cream that came with it was also wonderful. 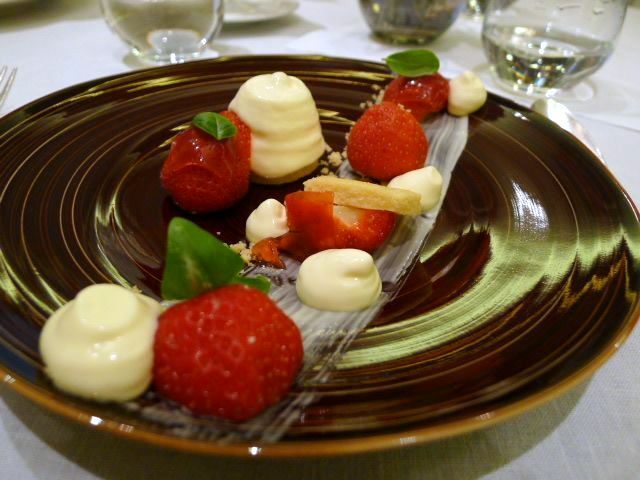 The service was professional and accommodating in the way you would expect of a Michelin restaurant. In the grand scheme of things, the set lunch menu was still good value considering the overall standard of the cooking. But by comparison, it really wasn’t as generous as what it use to be. Oh how times have changed. I guess the economy is affecting us all. Price range: The lunch menu is £25 for two courses and £30 for three courses. The a la carte menu is £65 for two courses and £75 for three courses. Excludes drinks and service.